The LGFA confirmed the infringement this afternoon, with Mayo awarded the points. 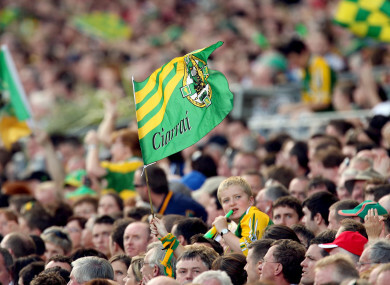 A general view of a Kerry flag (file pic). THE KERRY LADIES footballers have been docked three points in the Lidl Ladies National Football League Division 1 for fielding an unregistered player in their win over Mayo. The Ladies Gaelic Football Association (LGFA) released a statement this afternoon, confirming that Kerry had breached a rule in the February fixture, which finished 2-14 to 2-6 in Brosna. Subsequently, Mayo will now get the points. “The Ladies Gaelic Football Association can confirm that Kerry have been deducted three points from their Lidl NFL Division 1 fixture against Mayo on February 4, having found to be in breach of rule 55 of the LGFA official guide. The three points from the game have been awarded to Mayo. The player involved has not been named. With the points changing hands, it changes things up slightly in the top flight heading into Round 7 fixtures this weekend. Although no positions change, Mayo (5th) now have nine points under their belt — one behind Donegal (3rd) and Galway (4th), both on ten. With the top four playing off in semi-finals, all eyes will be on the Westerners’ meeting with Donegal in Swinford on Saturday. Meanwhile at the bottom of the table, the Kingdom (7th) now join Westmeath (8th) on zero points and they go head-to-head on Sunday in a battle for survival in Division 1. Mayo manager Peter Leahy spoke Midwest Radio earlier, stating that he was made aware of the infringement some time ago. Apologies it was one rather than three players ineligible. Incorrect info received via a connected party involved. “I think it’s very unfortunate for Kerry,” he said. “I was going to say harsh but harsh is the wrong word, rules are rules and they must be adhered to. “For any manager it’s very disheartening because we don’t check up on registration and all that kind of thing. You trust that that’ll be done. It slipped through the cracks, it happened. “It might give everybody a shock, including ourselves and every club across the country to say, ‘We must get our registration sorted out’. He added: “From our point of view, it’s not making a whole pile of difference. “Even the three points being given to us, we still have to win our last two games to make a semi-final. It hasn’t changed our outcome really, and it really hasn’t changed Kerry’s. Email “Kerry docked points for fielding unregistered player as Division 1 heats up”. Feedback on “Kerry docked points for fielding unregistered player as Division 1 heats up”.